Getting Started With Naviance: Whether you are brand new to the Naviance Network or are looking to refresh your skills, the Getting Started track will help you with your Naviance implementation, spark creative ideas for using Naviance in the classroom, and provide practical tips for using Naviance as a beginner. Creating a College-Going Culture: Preparing students for the next step in life includes creating a college-going culture within your school, district, or organization. Learn ways our Naviance Network members have successfully created fun, engaging environments where students are excited to learn and are ready for their postsecondary journey. Advanced Use of Naviance: Take the next step in your Naviance usage by attending the Advanced Use of Naviance track. 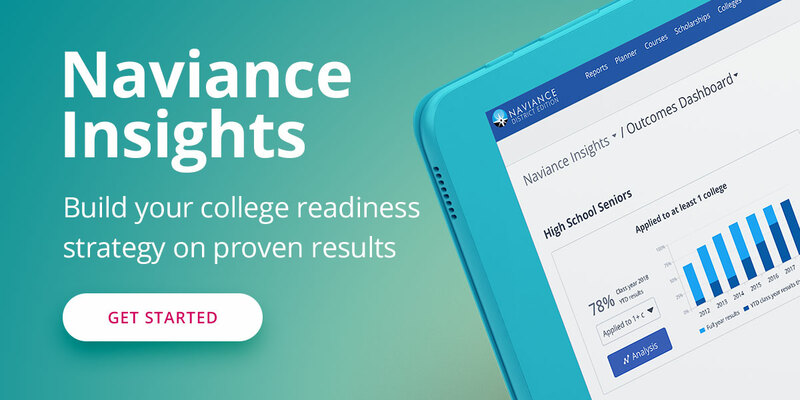 Dive deep into Naviance tools to enhance your everyday Naviance usage, as well as your curriculum, college counseling, and administration programs in general. Emerging Topics in Education: Our ever-changing world of education practices and policy brings quite a bit of discussion to the table. Join Naviance Network members, our keynote speaker, Naviance award winners, and higher education partners to discuss the education topics shaping tomorrow. Data, Reporting, and Analytics: Learn how big data can help you analyze your current student population, drive changes for the future, and promote your program in just a few clicks. This track not only shows you how schools and districts have driven change with data, but also the hands-on, click-by-click methods used to export this data. District Implementation: Whether you are a superintendent, district supervisor, or school-level staff, the District Implementation track will provide tips on not only implementing Naviance, but also driving your district toward success. Examples of large and small district programming and successes will inspire you for years to come. Naviance Partners: Join Naviance partners and Naviance Marketplace members as they discuss education trends, policy, and products that enhance your college counseling and Naviance programs. Hobsons staff will also be leading sessions on specific tools within Naviance, such as eDocs, Course Planner, Success Planner, The Naviance Curriculum, and more! We look forward to engaging you in the conversation, showing you best practices, and helping you collaborate with other Naviance Network members through this year’s sessions. Register today and start planning your NSI 2015 experience!